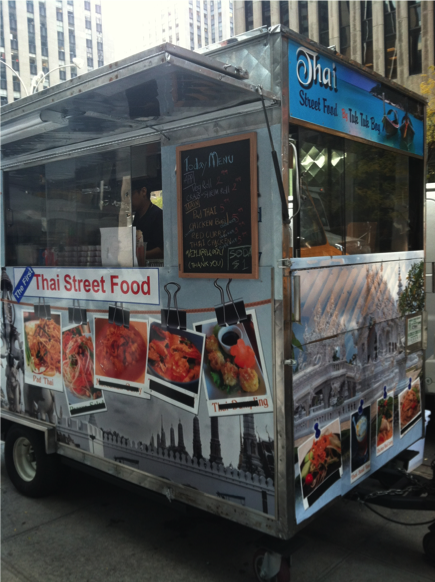 I heard rumors of Tuk Tuk Boy parking on 50th and 6th permanently last week and I was psyched to have some cheap Thai food right outside my office. I hoped it would be a rare gem and I resolved to try it for lunch today. Then, Midtown Lunch dropped the equivalent of an a-bomb on my Friday morning: Tuk Tuk Boy is not worth a try. Pad Thai is dry and lacking in garnishes; the line is long and result is unrewarding. No one mentioned the red curry though, so I remained young and foolish. 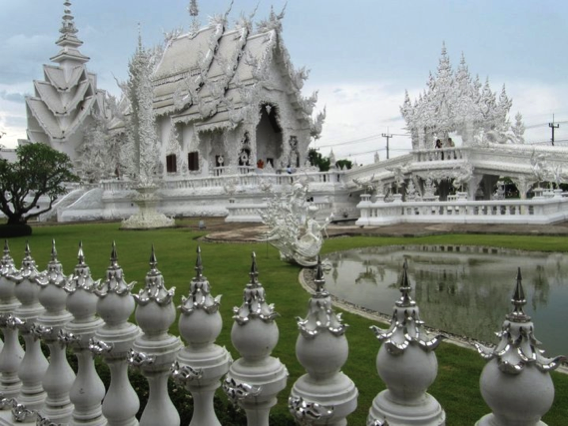 After all, I have personally been to the gorgeous white temple that adorns the side of the truck. This played on my emotions, people! Emotions! I got there at 12:15 and there was only one other customer waiting. I ordered the crab and shrimp rolls, $2.99, and the Chicken Red Curry over rice, $5.99. A line formed during the seven minutes I waited for my food. Someone walked away because they said that the chicken and rice dish would take 30 minutes. The cart is in place when I get to work in the morning before 9 am. There is no excuse for unpreparedness. I watched the guy inside pour the curry over the rice out of a wok and I even spied some Thai basil in the mix. The meal was served in one of those tin containers and on my walk back to the office I could sense through the plastic bag that the curry broth was leaking; maybe try a plastic tupperware container, tuk tuk man. Anyway, I can confirm Midtown Lunch's negative review. My red curry was bland and the rice was soggy and stuck together. There was lettuce with peanut dressing at one side of the tin, but it was engulfed in red curry broth which was of a watery consistency. Thai curry is supposed to be thin but this actually had little more taste than water. Also, I appreciate that you want to serve me a salad with my lunch, but please don't drown it! 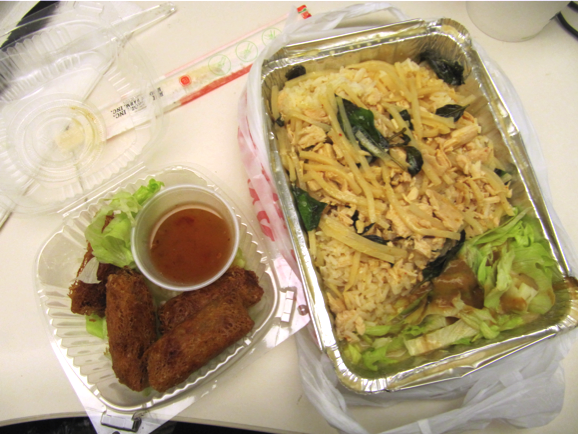 There were small pieces of chicken and bamboo shoots. The rolls were deep fried and tasted crabby, but the inside looked like nothing more than gray mush. Frozen at some point for sure. Probably as recently as this morning. Oh how I wished for an authentic Thai experience. I could even sacrifice authenticity if the meal was tasty. This was not a rare gem as I had hoped. Rather, it was a fake rare gem like so many tuk tuk drivers tried to peddle to me in Bangkok. Tuk Tuk Boy is a shoot and a miss, but hopefully it will inspire a new mobile Thai food industry that can better cater to my tastes! Tuk Tuk Boy: 50th St. between 6th and 7th Aves.